The origins of the Archaeological Museum Hamburg / Town Museum Harburg date back to the Museum Association for the Town and District of Harburg, founded in 1898. The association’s goal was to establish a museum for the then Prussian town and the rural district of Harburg. The first exhibition spaces were located in a school building at Harburg Rathausplatz, but due to the collection’s rapid growth the venue quickly became too small. In 1902 the museum association moved into the commercial school building at Kirchenplatz, where 14 rooms were used for the exhibition. A turning point followed in 1925: for the first time a separate building was used for the collection and exhibition. The museum moved into a spacious Wilhelminian style villa on Buxtehuder Straße that was donated by the sons of August Helms, the first association chairman. The name ‘Helms Museum’ goes back to this donation. There was always a need for space as the collection already included more than 50,000 objects, mainly of a historical and ethnographical nature. Back then archaeology was only of modest importance to the museum. This changed fundamentally when Willi Wegewitz (1898–1996) started as new museum director in 1930. During his long tenure in Harburg, he developed the house into a national and internationally recognized archaeological research center. During World War II, the museum building suffered severe damage and the exhibition had to be closed. In 1955 the main building was built as one of the first new major museum buildings in post-war Germany. In a second building period, a large hall with more than 400 seats for theatrical events was added. This made the museum the cultural center of Harburg. During the last nearly 120 years the museum has changed from being the historical museum of Harburg to the Archaeological Museum Hamburg. An important milestone for this was the consolidation of all state collections on prehistory and early history of Hamburg. Since 1972, all archaeological collections from the Museum für Hamburgische Geschichte, the Museum für Kunst und Gewerbe, the Museum für Völkerkunde and the Altonaer Museum were centralised under the auspices of the Archaeological Museum Hamburg (at that time called Helms-Museum). The museum’s new profile was rounded off when Hamburg’s department for preservation and care of field monuments became a part of the museum in 1987. Furthermore, the museum is the seat of the Landesarchäologie Hamburg as well as the Kreisarchäologie Harburg. In addition to the archaeological state museums in Schleswig (Schloss Gottorf) and Hannover (Niedersächsisches Landesmuseum), the Archaeological Museum Hamburg houses one of the largest collections on prehistory and early history of Northern Germany. Since 2004, more than 1.5 million objects of the collection have been moved to the new archaeological central archive of Hamburg and gradually saved in a digital inventory. Changing special exhibitions on all topics of archaeology and the history of Harburg can be seen year-round in the museum. The education department of the museum is well-known nationally and offers children, adolescents and adults an education programme that provides exciting insights into the world of archaeology, as well as information on the town history of Harburg and the special exhibitions. The collection of the Archaeological Museum Hamburg puts its focus on the archaeology of Northern Germany and the history of the town of Harburg. The archaeological collection of the museum concentrates on discoveries from the prehistory and early history of Hamburg and its metropolitan region. As a state museum, the Archaeological Museum Hamburg / Town Museum Harburg owns one of the largest collections of archaeological objects in Northern Germany. In addition to discoveries from Northern Germany, there are numerous archaeological treasures from all over the world that have made their way into the collection during the history of the museum which spans over 100 years. The discoveries are scientifically evaluated, partially restored and finally archived. Since 2004, more than 1.5 million objects have been gathered in the archaeological central archive. Originally the museum’s task was to exclusively explore the history of the town of Harburg. Harburg was independent until 1937 when it became a part of Hamburg. This will be the task of the Harburg Castle in the near future. Its basement is under construction to become a branch of the museum. The museum exclusively collects “Harburgensien” items, i.e. objects and documents produced in Harburg and/or by Harburg’s inhabitants or that have a close connection with the history of Harburg. More than 120 years ago, the Archaeological Museum Hamburg was founded as a museum of local history of the town of Harburg named “Helms-Museum”. The collections have had different focuses over time. The museum’s extensive collection of photographs of Harburg includes landscape pictures, building views as well as images of people and events from the end of the 19th century to the present day. One of the most important photographers from Harburg was Carl Timm, who had a close relationship to the museum. Artists from Harburg (such as Bokelmann, Müller-Vogelsang, Flebbe, Illies or Jaeger) partly achieved significance beyond the Harburg region. 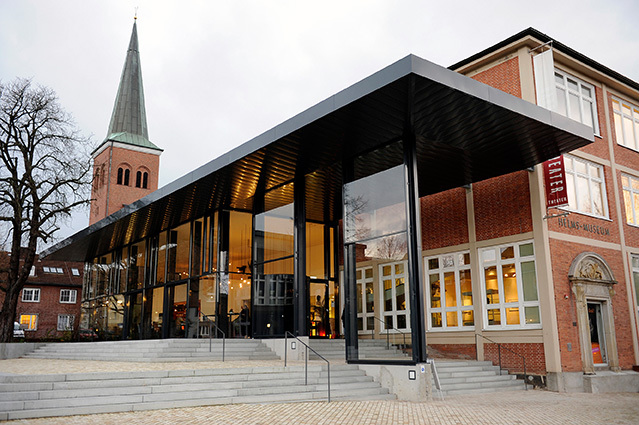 The museum collects the works of artists who have ties to Harburg through their biography as well as paintings and graphics with Harburg motifs. Earliest pictures of Harburg date back to the 17th century. Plans and maps of Harburg and the surrounding area are of particular interest to the public. The museum works continuously on expanding its extensive collection of topographical and thematic maps and plans. In addition to some trophies, the silver of the Harburg marksmen guild includes the shields of the royal chain. The oldest royal shields date back to the 16th century and were once donated by the dukes of Harburg. The first Harburg Vogelschießen festival took place in 1528 on the initiative of Duke Otto I.
Harburg gained importance as a former garrison town. The collection of the museum therefore includes a large number of weapons, uniforms, badges and medals, and other pieces of military equipment. The extensive collection of documents encompasses records of various kinds: official announcements, declarations on company documents, association chronicles, and private documents are among those included. One of the earliest documents is a letter from Harburg’s Duke Otto II to his mother from 1570.